This summer, Blue Reef Aquarium in Tynemouth have taken in two young seal pups to their Marine Rescue Centre. Both pups were brought in to Blue Reef from beaches in the North East and were suffering from injuries to their face. After a few months of treatment and plenty of fish, both seals were well enough to be released back into the sea. On Monday (9th October) the team took the seals up the coast to Seaton Sluice to re-introduce the pair into the wild. Both seals happily went back into the sea with aplomb. The team were happy to see them go and were delighted with how well they took to being back in the sea. Tynemouth’s Blue Reef Aquarium in partnership with the animal charity Pawz For Thought, BDMLR and the RSPCA have been rescuing and rehabilitating seals for over 10 years, during this period, over 200 Seals have been rescued. This adorable pair have attracted a lot of attention from the media. Take a look at some of the highlights of their moment in the spotlight! 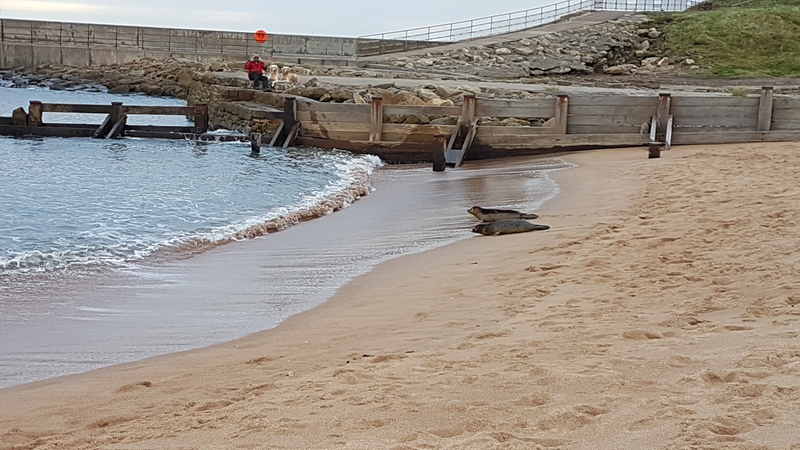 Our team spoke to the hosts of BBC Newcastle’s Breakfast Show to tell them all about the two seals and our plans for releasing them. They later spoke to Jon from Today’s North East just before they headed out to the beach for the release. The whole thing was captured live by BBC Look North on their Facebook Page. We also featured on local TV station Made in Tyne and Wear’s 6 o’clock news! Sun FM featured the story on their website.